Is Giannis Antetokounmpo the Bucks next 25.0 ppg scorer? The Milwaukee Bucks have gotten off to a respectable 3-2 start and their best player through these first five games has been Giannis Antetokounmpo. Giannis is averaging a team-high 24.0 points per game (ppg), leads the team in assists, and is tied (with Greg Monroe) for the team-lead in rebounds. There is still a lot of season to be played, but let’s forecast a little. If Giannis keeps up this pace for the season, especially when it comes to points scored, he could become the first Bucks player to average 25 or more points per game in a season since Michael Redd did it in 2006-07. Over the course of the Bucks history, there has been only nine times when a player averaged 25 or more points for the team in a campaign: Kareem Abdul-Jabbar did it six times with the team, and he holds the team record for highest ppg average at 34.8 in 1971-72. In fact, Jabbar has the top six ppg in Bucks history. Here’s a look at the nine times when a Bucks player averaged 25.0 or more ppg in a season. Let’s drop the ppg down a little for another stat. When it comes to Bucks players who have averaged 20 or more points per game in a season (minimum of 41 games played), there have been 44 times in team history that a player ended the season averaging 20 points or more. Eleven different players have reached this milestone for the team. Leading the way is Glenn Robinson who averaged 20.0 or more points per season seven times with the Bucks. Here are the Bucks players who averaged 20 or more points in a season. Will Giannis join the group with a 25.0 ppg season in 2016-17? 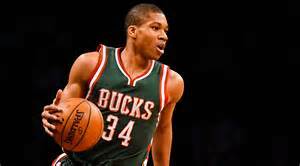 Or will he become the 12th player to average 20 or more in a season for the Bucks?